F&D Laptop Speakers (V560, V620 & E200) - Are They Any Good ? First of all, one must understand the difference between USB Support and USB Powered Speakers (this review is all about the later one). Speakers with USB Support will let you play your music files straight out of the memory stick or thumb drive or memory cards. Whereas, the USB Powered speakers are the different breeds which need USB port to power them up while playing. Having said that, for those who find built-in laptop sounds too mediocre or metallic to hear and looking for a portable speaker with good mobility, Fenda (F&D) has a product line addressing the same. And if you are on a netbook, then this becomes an absolute necessity. They are the tiny yet fair sounding units which will escalate laptop music experience with significant margin. Since mobility is the key factor, these speakers will not need you to run for power port in room or elsewhere. All it needs is a laptop with free USB port from which they will draw power required to give out loud and bang ! Since my job requires me to keep many times on the wheel, and being a music aficionado I always missed my listening experience at home. And I don’t wanted to keep hooked everytime over the headphone to entertain or musically rejuvenate myself. Hence, I zeroed in over few laptop speaker models by F&D and bagged the one. Each one had its own sets of feature and usability which came with varied form factor. Here is my take over all three models depending upon my experience at showroom and the one I bought. F&D V560 – Tiny But Not Tinny In Sound! Mounted over the laptop will make it look like ears of the same! When I entered the shop, this was the only model in my mind which I knew and was willing to purchase. While opening the packet for me, the shop owner also produced the colorful rim attachments which came packed with it. This will allure many of the buyers as it will complement their laptop color with all possible shades (red, silver and blue) – now gadgets too have gotten into fashion statements! After having connected with the laptop, these tiny tots managed to produce decent soundstage with all genres (even movies). Highs were crystal clear and lows were all audible if not that loud (mind you, you are playing everything over that size which is meant for twitter in general speakers). It definitely gave a boost to default laptop sound and justified the statement “Good things come in small package”. With sturdy build quality and clamp design, F&D V560 comes out to be a mini steal for the price it comes for. And did I forget to add that it also comes packed with mini-pouch to make a comfortable carrying?! F&D V620 – Lean But Not Mean! Prima Facie, it looked like Speakers on diet! This came out of the shelf as per the vendor’s suggestion. He wanted me to audition this piece too prior to make a final decision. And the moment I took these in my hand, its significant weight (symbolic of build quality and materials enclosed) assured me of its performance in advance. Unlike F&D V560, this sits like a normal desktop speaker with minimal footprint. When connected with USB port, the bottom started glowing blue which looked flashy and cool (some may find it overdone). And when played, I was not wrong with my pre-assumption. It barely missed any of the notes that were fed in the form of Electronica, Pop, Classical, Instrumental etc. The trebles were crisp and bass was prominent (springy as they call). Yes, the sound distorted a bit when volume cranked at max, but that is acceptable as nobody would like to over-exploit it. Conclusively, it had good balance of size and performance. F&D E200 – Acoustic Avtar In A Bar ! I almost reached my wallet to finalize F&D V620 but then this soundbar F&D E200 suddenly caught my sight. Inquiring further led me to know that this again is USB powered speaker with different form factor. This indeed is a 2.0 model enclosed in single housing. Slightly bigger than above two, this left me impressed with its sonic quality as it played all tracks with comparable quality. A glowing red ring around the volume knob adds to some visual gimmickry, the look of which may be subjective to all. I had to make a choice – so I banked upon this model considering its louder performance compared to F&D V560 & F&D V620 and bar type design for easy play. First thing first, these mini-monsters are not meant for roomful of entertainment with loud performance but for full-stage personal listening. Though they fall into same category but are radically different from each other. If space is the major concern and laptop bag is already stuffed, then F&D V560 will be the best buy coupled with decent sound quality. But if you are looking for best in this category with good size to sonic ratio, then look no further than F&D V620 and it will easily accommodate along with laptop in the bag you carry. F&D E200 undoubtedly is the best of all three when it comes to loudness and quality but its size may bother you a bit. But if you don’t mind carrying it in a travel bag (it indeed can be slipped in bigger laptop bags), then this will leave you as a happy buyer. Pricewise, there is not much difference between all these sets, hence the buying decision will be solely based on purpose, portability and usability. F&D V560 – for Highest portability with GOOD sound quality. F&D V620 – for Decent portability with BETTER sound quality. F&D E200 – for Lowest portability with BEST sound quality. Great verdict liked the way explained all three, i will go with F&D E200. Thanks again. we do have v620 plus in market so is it better than e200 and also I am getting v620 and e200 for same price via offers. Now which one to choose as by MRP v620 =1290 and e200=990 so why so if e200 is better. While listening, e200 was little louder to me and packed more power (I purchased that only). But this doesn’t mean, v620 was weak. And since both the speakers fall in different category when their footprints are concerned, there cant be a direct comparison. If you are looking out v620, you’ll indeed not regret your purchase as it has good stereo imaging (because the speakers can be kept far apart) and quality sound. No idea that how v620 Plus differs from the model featured above – purchase and enlighten me over that ! I would like to know your opinion on Logitech Multimedia Speaker Z50 as against E200 or V620. Which one would you recommend considering portability and performance? Logitech Z50 for me is little overpriced and delivers marginal or no superiority over E200 & V620. Though an eye-candy, it is neither portable nor full blown set of speakers. This also needs a dedicated power supply from mains which reminds me of tiny speakers which were popular during old days when 2.1 speakers were just catching up. Last but not the least, this certainly doesn’t belongs to USB powered laptop speakers either. Sound is not that bad, but you can look out for better option for the money it asks for. Thanks Amit so much for such a prompt response. Now Z50 out of the picture, what would you recommend as a better option? I would also like to know which one would you recommend between F&D Swan-White and Logitech X100 in bluetooth speakers category? When considering bluetooth speakers, F&D Swan white is something where style meets performance. Whereas, the one from Logitech also does the decent job of music playback extending your mobile’s capability. Honestly, I haven’t tested them neck to neck, I’m afraid if I can pass any conclusive decision when it comes to sound. But for the model and built, Logitech X100 will make a better travel companion because of its flat design. Swan is also a sturdy piece, but its protruding neck may bother you a bit while stuffing it into your bag. So, it is ergonomics that will help you making decision. For the sound, I presume difference will be marginal for the reviews given by users. Thanks again for the prompt response, Amit. Logitech X100 I’m getting for around 1450/- bucks on amazon. Would you be buying the same for the quoted price? Or, would you rather recommend a better option around the same price or less? is f&d a reliable brand ? i am planning to buy f&d e200 soundbar.can i play songs via mobile phone? The answer is both yes and no !!! As these speakers are meant to be powered with USB for playing, you need to power them up with that port (or with AC mains to USB converter). Audio input it via standard 3.5 mm jack which may couple up with the mobile. But I’ll advise to look elsewhere if you want to play with mobile only. I need to know whether it can deliver good bass output slightly comparable to sub woofer. i need bass output but i can’t buy expensive product .this one comes in my budget .so please help me out i’m thinking to buy this F & D E200. Laptop/Portable speakers have their own set of limitations. You can’t have normal 2.1 types of experience with these tiny siblings. Since none of the model here comes with a sub-woofer (for the obvious reason of portability & power input), deep & heart thumping bass may not show their presence. You can look out for their budget desktop speakers like F&D F203G or some good low price model from iBall which is only slightly higher than E200. 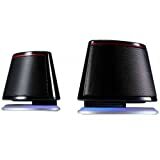 U just want to know can i play these speakers using the usb powere adapter given with my Android phone?…its 5v 2000mA…can i use it as its power source…?.will it any way harm the device?…rply would be helpful. .thank u in advance. Hi.. Nice article. I am using a ps3 n ps4 to watch movies n play games n music. I am searching for either a soundbar with sub which has optical input n supports dts. Or a 5.1 home theatre system with dts n Dolby n optical input. I want to know which is the best option available in India and of course the cheapest available with best quality. Awaiting for ur reply. Thanks in advance. Cheers mate. Hi Amit, I am impressed with your pilanthropy here replying and putting so much time n effort helping all. If considering for Bedroom, then look no further than any 2.0 system. It will save you some space, running wires across the room, warm listening experience (with good mid range frequency reproduction). If you can raise you budget a bit, F&D R30BT will give you best of all worlds. It looks good and sounds good ! On a different note, if you can hold it for a while, then wait for Google Chromecast Audio to officially launch in India (available on eBay through imports though). The advantage of this device is that you can turn any normal speaker into wireless babies with this receiver. And the major advantage is that it streams WiFi audio than compressed and mediocre sounding BlueTooth streaming. And rather than going for Bluetooth speakers, you will now have a liberty of choosing better speakers without paying extra for bluetooth features. You can. But will have to manage USB power and the TV should have 3.5mm connecter. But, your LED TV will have more or better sound output than this. Hence, it will hardly impress you further and it may not be worth the hassle. I get noticed that f & d e200 does use the power of 2*1.5 watts and e200 plus(bluetooth) use the power of 2*2.5 watts…but being the same model(only the difference of bluetooth connectivity) wil the second one provide better output[i found that in e-shopping sites some of buyers r mentioning the e200 plus(bluetooth) having a goodness of bass…where the buyer of e200(wired) mentionig ti havig a low(but satisfectory) bass]…? i am confused…and wanna buy e200 plus…will it provide me little more bass? Great posts. Exactly the things an amateur like me is looking for. I needed some advice. I am looking to gift a soundbar to my brother who watches things on both his big flatscreen and laptop. The objective is to give him something that would be small enough to use at his desk and decently powerful enough to couple with the TV if needed. Bluetooth functionality would be a plus. The budget is 2000 (flexible to go a little higher as well). I read that the E200+ comes with bluetooth compatibility as well and understand from your posts that F&D makes reasonable priced good products. Any advice? Apologies if this is inappropriate. I wouldn’t recommend E200 soundbar if looking to connect it with TV. The inbuilt speakers of your TV will be more powerful than these. There was a model which came coupled with a subwoofer, but I’m not sure if it is still available. An able soundbar will be way beyond the budget, so I’d recommend to stick with a decent 2.1 speakers for the purpose. After all it is the performance which must come over the priority, next is ergonomics ! I would like to connect F&D e 200 to my Vu 40″ LED Tv. I am not happy with TV’s sound.After connecting can volume control of e 200 be done by TV’s remote? Also my budget is Rs.1000 or below.Thanks in advance for your time. Yes, the volume can be controlled via TV remote (as it will control the sound output of TV being fed to speakers). But E200 is something that I wont recommend with TV as it will still sound under-powered. You can get a decent 2.1 speaker from the same brand with the budget you have quoted. Swan if you can afford few extra bucks. It has good portability than E200 and looks way cool ! Both are neck to neck. Given that V620 is a separated piece, it produces a wider soundstage and with enveloping sonics. E200, is loud but also compact and sturdy. Choice is yours!